Who doesn't love watch those cheesy quiz shows on TV as you answer along and test how well you'd do on the show. The FunBlast Trivia Free app for your iPod touch, iPad, and iPhone gives users a chance to play along in a quiz game that is challenging and addictive. The trivia questions cover pretty much every topic you can think of including history, pop culture, music, literature, and TV. You likely won’t be an expert in every category but you will be a whiz in some. Additionally, this app is featured in our list of the Best Trivia apps for iPhone and iPad. Yes there are tons of trivia games out there but let's be honest: they definitely aren't all at the same level. The FunBlast Trivia Free app strives to be unique by providing users with 40 different sound effects and even animations to make this one feel more like a real TV trivia show. You are given a variety of challenges such as going up against friends on Facebook, and the game app offers one-player mode, team mode, and two-player mode. There are also four different game modes, each with their own features and rules. Of course the app supports Leaderboards so you can aim to hit the top. The app is free to play but there are plenty of categories/topics that require an in-app purchase in order to play them. These are priced from $0.99 to $2.99. The app gets four out of five stars from users who seem to love the fun this one dishes out. I have to admit right from the start that I am a complete sucker for trivia games. What I really like about the FunBlast Trivia app is the different ways you can play; it really takes this one to the next level of fun and challenge. It also means the app has more lasting-power because you’re likely to come back to it time and time again. When you pick your game mode you are given blurb on what the goals are in the mode and how to play. Each of the modes move along well with content loading smoothly and quickly. There are a number of categories that are locked but there are still plenty to play for free and get a hang of the game. The sound effects are definitely cute but the graphics in this game are pretty bottom of the barrel. In that sense the game falls flat but don’t let that stop you from checking it out; the graphics are hardly important in this game. 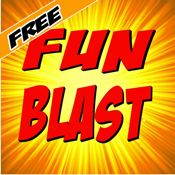 The FunBlast Trivia Free game for your iPod touch, iPad, and iPhone can most definitely help you pass time in a fun way. Even though the user interface is quite basic the game doesn’t suffer in the least.